In the final programme, food writer Stefan Gates continues to explore some of the most controversial food issues and dangerous places in the world. 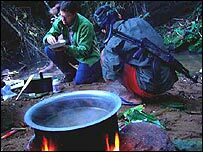 Stefan continues his culinary journey around the world with his most dangerous trip yet - smuggling himself into the jungles of eastern Burma, where the Karen people are fighting a vicious guerrilla war with the Burmese army. Stefan goes on patrol with a Karen rebel group deep into the jungle to check on isolated villages that are under constant threat of attack from the Burmese army. There he finds villagers whose fields have been mined to stop them harvesting their crops, and whose homes are often looted by the Burmese army. The patrol must survive on a little rice and what they can catch in the jungle, even if that means eating endangered animals. Leaving Burma behind, Stefan travels to Venezuela, which is in the midst of a socialist revolution led by President Hugo Chavez. He arrives the day after President Chavez is re-elected and finds a country split down the middle, locked in a battle between rich and poor. Key to this battle is the president's massive redistribution of land and food to the poor, paid for with oil exports. During the trip Stefan cooks in the slum's soup kitchens, investigates food shortages in subsidized shops, and meets one of the richest men in the country who has been battling with "land invaders" for five years.